A Preston based husband and wife team, Margaret and Neil Catlow, are achieving their ambitions to support and mentor young people and adults in Lancashire through an innovative programme, the Lancashire Access to Mentoring Project (LAMP), part-funded by the European Union through the European Social Fund and co-financed by the Learning and Skills Council Lancashire. The project is being run by the Lancashire Education Business Partnership and aims to build capacity in mentoring by providing wider access and participation in mentoring. LAMP provides voluntary and community organisations, such as Blackpool Foyer, HomeStart, the Prince’s Trust and Lancashire Youth Association which use mentoring as a strategy, with a framework to ensure that their staff and volunteers are well trained through a structured training programme. The project was launched in April 2004 and will provide mentoring training for 300 individuals across Lancashire by the end of 2006. Margaret Catlow left school without any qualifications due to her mother’s ill health. She decided to embark on the project in April 2004 following years of working as a volunteer with a range of organisations including ‘Supporting Fylde Families’. This work saw her supporting children and their families across Lancashire. 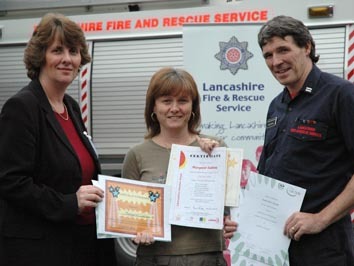 Her husband, Neil, is a sub-officer at Lancashire Fire and Rescue Service and a volunteer mentor for the Prince’s Trust. I realised that I could be a more effective mentor and improve my employability if I could enhance some of my communication, active listening and questioning skills’ explains Margaret. ‘It has always been my ambition to work with children and through my voluntary work I have the perfect opportunity, but lack confidence in relating to children, which I feel was holding me back.’ Adds Neil, ‘I felt I could be a more effective mentor and improve my chances of promotion if I enhanced my skills. In particular, I wanted to improve my listening skills which would be of great benefit in all areas of my life – at work, at home and as a volunteer. Both Margaret and Neil embarked on the Lancashire Access to Mentoring Project which commenced with a half day Introduction to Mentoring Course, leading to a Level 2 Open College Network Award in Mentoring. This coincided with a Level 3 Advice and Guidance Certificate in Mentoring at CETAD, Lancaster University. The courses covered a range of areas relating to mentoring including understanding the role of the mentor, understanding the importance of good communication skills and recognising the skills needed to build and manage an effective mentoring relationship. ‘Mentoring is rapidly gaining recognition as an effective way to support people to grow, develop and achieve their potential in all walks of life’ explains Margaret Boardman, LAMP Project Manager at Lancashire Education Business Partnership. ‘This programme has allowed us to develop a structured approach that we didn’t have before, ensuring that we drive quality through mentoring training. We are already seeing powerful examples of how this programme is changing people’s lives and opening up career routes for individuals who are committed to developing their mentoring skills.’ Six months on, Margaret and Neil have both achieved their aim to complete the two awards, and Margaret has now started on a full-time course at Preston College in Social Science and Social Work, following which she hopes to build on her experience of working with young people. ‘I have made a lot of progress over the last 6 months. Setting and achieving my personal goals has really boosted my confidence and I feel that I am doing something really worthwhile. I am sure that during the last few months I have been able to pass on my new skills to my mentee. Completing the programme has definitely improved my career prospects and will be a foundation as I commence my course at Preston College’ says Margaret. Neil plans to build on the skills he has gained through LAMP both in his own workplace, and by supporting young people who are seeking to set up their own businesses with the Prince’s Trust. For further information about the Lancashire Access to Mentoring Project, contact Margaret Boardman at Lancashire Education Business Partnership on 01254 584090.